Dungeon Raid is not your typical match-3 game, it's Puzzle Quest meets Rogue like dungeon crawling. One stat that you can focus on above all others is Weapon Damage. Anytime you have to pick two skills or an item, always select one that improves Weapon Damage if available.You'll want to maintain Weapon Damage so that you only use two swords to defeat any skull group. The next key is the Enchant spell that gives you an instant item upgrade. This spell is a bit broken as it winds up giving you too many upgrades. Make sure to keep an open spell spot until Enchant finally rolls around. Next pick other spells that focus on clearing the entire board of skulls. So pick Explosive Potion, Teleport, and the one that turns skulls into swords. You may need these spells occasionally in the early part of the game but can pretty much do without them now. That's about it. For the other skills after Weapon Damage, focus on Regeneration, Defense, and Base Damage. Ignore Blunt and Spike. You don't want skulls to hit you for more than one turn, so you may find Blunt and Spike useless. If you are looking to unlock all of the classes first and foremost, play as the Adventurer (basically playing the game classless with all unlocked skills available but no cool race or class bonuses/penalties) since any trophies found will have to be for new classes since you can never level the Adventurer class. This is also nice since once all classes are unlocked, playing as any given class will then guarantee any unlocks will be further levels in the class you're playing (thus allowing you to direct which races and skills you unlock first). 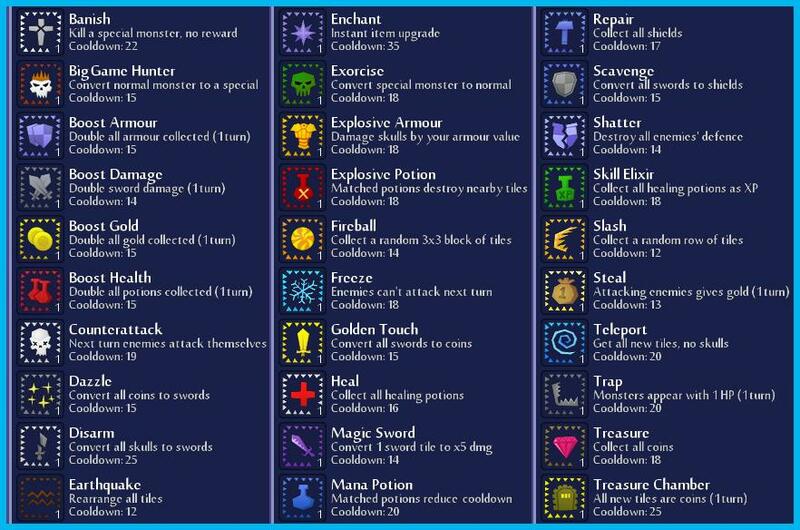 Any skill that clears the board of a certain item (Heal, Repair, Skill Elixir, Gem..thing, whatever) + Treasure Chamber. Treasure chamber makes it so that all new tiles are coins for 1 turn. Except using a board-clear skill doesn't count as a turn. So if you've been stocking up potions on the board, then turn on Treasure Chamber and use Heal, you'll get a board full of coins. Now collect all those coins in the normal way (using up your turn), and you'll get another board full of coins. Dazzle and/or Disarm + Scavenge (swords to shields) + Boost Armor (double shields). An easy way to deal with Spikey special monster if you don't have any skills to get rid of him is to just keep your shields up and let blunt take his damage down to 1, the minimum. Then you can let your spikes wear him down until its safe to kill him. 4) Expect to have 1 or 2 skulls hitting you for their pathetic damage, and don't think about killing such a small number of skulls unless it will help link groups for a bigger clear. What this does is sharply increase your gold and exp achieved over the initial easy turns, because you will be collecting more coins and fighting more skulls. You are turning over more tiles per turn, so clearly you are seeing and collecting more total gold, killing more skulls and getting more shields. While you will be at 0/4 or 0/5 when you grab that big group of shields, the strategy probably also increases your net upgrades as well, because you will get a lot more total shields, a lot more bonus shields, and will be "protected" from further shield loss when at 0/4 or 0/5. 1) You are in a lot of trouble and have a decent amount of coins on the board, even 4-5 coins can create an epic sword/skull chain and save you from a certain death. 2) Coins arguably are the least important thing to collect and so sacrificing your coins in order to get more kills is always great. Even if you are not immediately threatened, Dazzle can be great to give you a board full of Swords to take on tough bosses or when you get to late game and enemies start hitting like trucks. Use Dazzle preemptively for best results. The only thing being possibly better than Dazzle is Disarm, although Disarm has a longer cool down I believe and you can lose lots of exp this way, which can be detrimental in the long run. Arguably the best skill in the game, always take this if it is available to you. Some bosses are much more difficult than others and can be extremely annoying if not dealt with properly. For instance, try to teleport every time you see a Spike boss (returns damage on attack), a Fire Boss (damages you when you attack around it), or the boss that makes your Cool downs not refresh. This skill is just amazing. Early game your primary focus should be on getting as much EXP as possible while making sure to keep your damage upgraded. Here's a brief overview of what are the most important stats. +EXP So amazing early game. If you can get large amounts of +EXP and damage with a good skill set, you will easily make it to late game. +Durability: Generally an overlooked Stat. Insanely powerful into late game, even after the nerf you should ALWAYS get this stat if it is available as an upgrade. +Dext: Dext is great as it not only gives you extra shields on collection, but the chance of getting bonus shield as well. +Life Leech: Generally avoid this early game as there are other stats that should take priority. However, once your damage becomes more significant (lvl 15+) life leech should take priority over everything except Durability. It is incredibly powerful. +Vita: Always make sure you have a decent HP pool, do not overlook vita at any point in the game. Vita should be prioritized over +HP because vita gives the extra potion as well. +Luck: Decent stat, the +potion is excellent for late game. +Blunting: Not a bad stat combined with high durability, although with the nerf to Durability, blunting is not as powerful. Generally avoid this as it doesn't help much late game anymore. Spikes: Honestly, just completely avoid this stat all together. +Base Damage: Only take this if none of the other stats are available. Thanks for this strategy offered. I've been playing a lot & have a very different strategy, but it's great to read yours. I promise TK put something on my blog - soon. I've been trying to do 'combos' of skills, and I've been also trying combos of 'non-skill' abilities (like blunt, poison, etc). 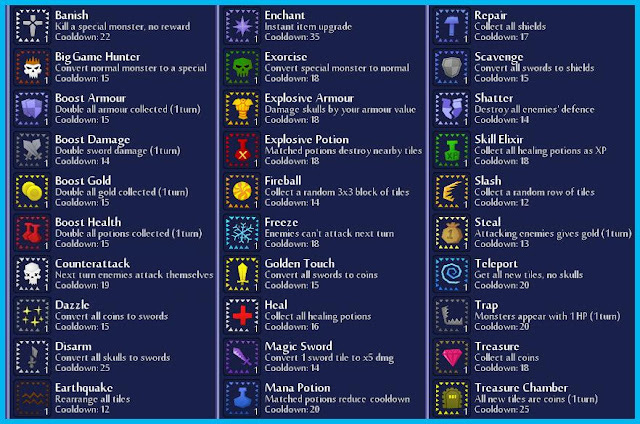 Generally, I like dazzle - 'turn coins to swords' and treasure chamber - 'new items are coins' combo, and there are a few versions of this. Trying this w/big game hunter' is fun -- but can be dangerous! Another maneuver I've been doing is collecting less rows (keeping it to 3) unless it's coins. Shields need constant replenishment, so... I try to leave 3 'clumped'. Certain skills I don't use barely at all, like exploding potions (which you recommended) or freeze. Earthquake, teleport, & slash can save you. Skill Elixir: totally agree with everything you say. It is amazing and let's you keep ahead is the skulls getting stronger. Enchant: another skill to keep you ahead of the curve. Sure, long cooldown, but great once upgraded and free upgrades are literally priceless. Big Game Hunter: if used right, not risky at all. When you've set up a wall of skulls and enough swords about to be cleared and all connected, use it. With enough damage, many times I am clearing 2 or more bosses in one go. You just have to set it up. It translates into a lot of XP and gold at any stage of the game. Teleport / Dazzle: to avoid Spike bosses early on, Dazzle is excellent. However, when you reach a really high level and become next to invincible (I'm talking 2500+ health), you'll not have used it for a long time. Spike bosses are killed safely without doing enough damage to you. Dazzle is probably my preferred given your reasons above; in the late game, money matters very little. Weapon damage is key. You need to be able to kill skulls quickly, even if it's just with 1 sword (and another skull) or 2. Blunting: here's where we disagree. I find it life saver! I get it as soonas it shows up, as it seems rarer than weapon damage. If a new blunting shows up for another piece of armor, that is preferable then improving a previous blunting because it increases the chances any blunting can be upgraded later. It's amazing because it gives you priority: often you just can't kill new skulls the turn they arrive. If more keep on arriving, when deciding which to kill, just look at their damage: the fresh 10 damage ones, or the small group down to 2 damage? It'll also allow you to ignore lone skulls where someone without blunting can't: theirs are still doing 10+ damage like the turn they arrived. Mine are doing 1, and it is completely shielded. It really saves you as your health begins to drop: each turn you lose less health, greatly reducing pressure and allowing time to even grab shields before you can grab potions. Shield Durability: for max blunting synergy. Luck: as your health increases, potions need to be able to fill you up more efficiently. Base Damage / Regenerate / Leech: base damage is helps with killing, but you're better off leveling up damage. If you make it really late, this number gets insanely high when all you level up becomes damage and health (because everything already gives you 100% bonus whatever). Regenerate is just a nice passive in the beginning, but as your damage soars, leech is way more efficient. You spend most your time killing skulls anyway, to get back a portion I. Health is priceless. I never take Spikes. Way too little damage to enemies in the late game. For my money, Dazzle is about the most powerful skill out there, as it does the two things that you want to be doing - killing skulls and cycling through a lot of tiles every turn. In general I try to build my skill set around getting rid of a lot of tiles each turn, so ideally I'll back up Dazzle with Repair and Heal. For the final slot I've tried Enchant, but I actually prefer Big Game Hunter. It's not very difficult to set up to be able to kill whatever special monster comes from BGH, and special monsters are worth plenty of experience and money. The additional upgrades you get with the extra level-ups offset not having an upgrade every 15 turns. Skill Elixir I like, and for a long while it was my go to skill for high scores, but I've actually found that in the late game I'd rather be collecting potions for health than XP, and I don't really ever want to be doing so by tracing lines between them. otherwise, thax for you advices guys ! damage, cooldowns, health, defense or blunting. my best so far is level 77 raider in 20 min using masochism heavily, i was getting huge enemy kills with like 10 coins into monsters. awesome awesome awesome skill. i have 95 spikes. No enemy lasts on the board more then 2 turns, with 224 armour and 90% durability I don't even need to attack monsters anymore. However I've not managed a single class upgrade at all. Any tips on how to do this? Kye, I believe you need to be playing on either hard or normal to get more classes, being lvl 185 sounds like you're playing on easy. I agree with a lot of what you said here, but would add a couple things. First, the Piercing weapon ability is phenomenal later in the game when boss skulls start getting insanely high armor stats. Especially useful on the gold bosses and the couple that have higher-than-normal defense. If you can get only two upgrades in it, I think that takes you to around 20% which is more than enough to get the job done. Also, strategically, I like the combo of Magic Sword/Disarm/Heal/Teleport. The Magic Sword helps a ton with bosses, especially if you can level it and drop them every 8 or so turns and build up a large stash. It serves as my main offensive spell. The other three are all defensive (except Disarm which can be used offensively against bosses). Those three, leveled highly and used rotationally, will essentially make you invincible. As you noted, even when you don't need big clears of an item, try to always go for the home run clear ESPECIALLY EARLY. Mathematically, it just makes sense. Slow the leveling of opponents, increase your bonus chances, and keep fresh tiles flowing in. Also, try to stay ahead on the curve with Str/Dmg and Health, as well as one other ability that you want to specialize in (I prefer luck, leech, and defense above the others). Focus entirely on getting the halfling +1 to max armor bonus and clearing the board of whatever there is most of. Use properly timed Skill Elixirs and Repairs after Treasure Chamber to essentially double the result of Treasure Chamber. Convert Treasure Chambers into "Masochism Chambers" as often as you can, as well (to get the +1 to max armor). Focus on upgrading anything that gives you better upgrading, with priority towards UP (which provides better and more versatile abilities, overall). Secondary to upgrades, upgrade your damage; the hard part, in the end game, will be killing specials, and you'll need high damage to do that. Using this strategy I got a Score of 38065 in Normal mode (696 turns, 18425 XP, 8936 GP, 6008 UP). I haven't tried modifying my strategy to focus on Blunting and Spikes more than damage, yet. That seems like it would be a better longterm strategy, if only Spikes and (especially) Blunting weren't so rare.